This is a new series comprised of past journal entries I wrote followed by some current thoughts about it, if I have any. The reason for sharing a particular entry will vary. Some may be recorded story ideas, interesting events from my past, or some weird or fun thought I had that I wrote down. Idea for a species that is overprotective of children, so makes them live in knockerball-like aparati (the plural of aparatus). Time passes and the species develops severe germophobia. 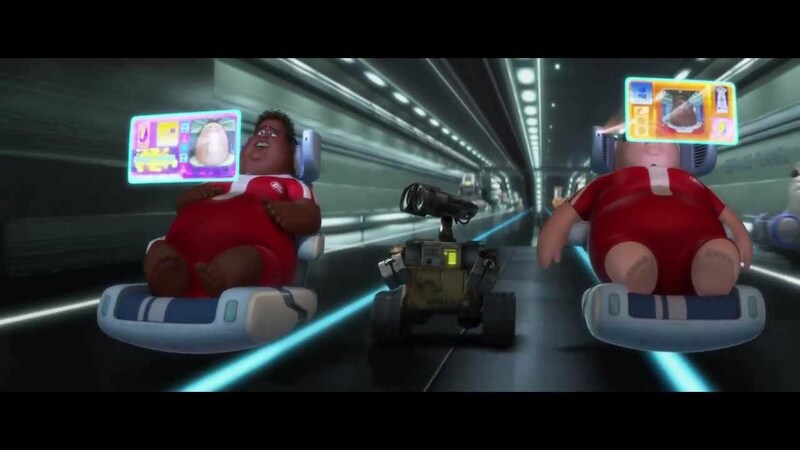 The “knockerballs” increase in tech and soon allow the individuals to do everything, like the chairs in Wall-E for the humans. The species hates interacting with others outside of their bubbles and having actual contact with them — this culminates in a population crisis of some sort because so few members of the species actually reproduce. I had this idea with two of my friends at a get together where we played knockerball. Parts of the idea were mine, parts of it weren’t. I really like this idea, and wanted to co-write something with those two friends, so I should reach out to them and see if we could do that. What if humans (or some other species) could connect their brains and share information that way? Like, instead of teachers standing in front of a classroom to teach students things, their brains would be connected and the teacher would send the lesson, facts, assignments, etc. straight to their brains. Or to teach someone else to crochet, your brain would send theirs the details of how to do it. This could turn into a story idea at some point. We’ll see. I think this could make for a really interesting story world. What the story would be, I don’t know, but I like it. If someone wants to use this concept as a prompt, please do and send me what you come up with! Maybe we could do a crowd-sourced (ish) collaboration project and make a collection of short stories based on this idea. If you’d be interested in that, comment below or email me at alyssachantelwright@gmail.com. There is an extent to which the way you write tells the world a little something about how you read. I, for example, write very much as though the events are happening and I’m recording them as they do — almost like writing a book based on a movie, only better. The words are meant to be very visual, the reader should see in their mind the events as they unfold, watch as the characters move around, listen as they speak. It’s almost as though Mystical Warriors was meant to be a movie script but I wrote it in plain prose. I think this was inspired at least partially by my friends telling me the opening scene for my novel-in-progress felt very much like a movie scene. Similar to the July and August installments of this series, I will be sharing poems I wrote in September of previous years. Are only the surface emotion. To see the inner courtyard. After the soccer season ended. different kind of workout entirely. or I wish it was. who can never know this love. The witch controlled it with her wand. on this fateful Tuesday morn. and darkness fell over the room. as the sound enveloped the room. Lost in the silence of her shock. careful to not lose control of her sound. steadying her wand to keep the music out of sight. so you’ll be coming with us. she spoke cheerily and smiled sweetly. bringing the music to a crescendo again. the nosferatu crumbled and covered her ears. The music as a weapon would bring an escape! Why hadn’t the queen thought that the tune might change? and swords in their hands. My drawing style has changed a lot in the last few years. This is especially noticeable when I compare the first drawing in my current sketchbook to my most recent drawings of the main four in Mystical Warriors. That drawing is in my portfolio. This is the third distinctive style I’ve had over the years. It is still somewhat comparable to an “anime” style, but it is more realistic now than it was before. I hope I keep this style for a while, but who knows how long it will last? It will definitely change in the future, all with the developing abilities of an artist. It happens, it’s expected, it’s welcome, it’s evidence of progressing skill. I also received feedback from [two of my friends] about the transformation of my art style–[friend 1] likes my current style best! [Friend 2] said she thought I was really good at drawing people. [The girl I had just met days before] didn’t have much to say, but she’s quieter, and doesn’t know me well. More recently I have not spent as much time drawing, but my style is still similar to then. Some of you reading have never met me, but over the next year and beyond you will probably come to know me better, even if it is in a limited sense. Since I only now started blogging, I cannot point you to any posts with more details about the events and progress I am referencing in the body of this post. I plan to do this again next year, however, and there should be a plethora of blog posts about the events I mention in my reflection. Today I am eighteen. Legally an adult. Wow. I still can’t believe it. It sure doesn’t feel like it’s been that long. I could take this reflection in a direction similar to Life Is What You Make It, but that’s not what I plan to do. I want to look over the past year and how I’ve grown and some of the big things that happened. It’s really too bad I didn’t start blogging a year ago instead of only a week ago. Last year about this time I was a recent high school graduate. I had procrastinated calling the local high school about my failed driver’s ed behind the wheel and so did not yet have my license. Once I did meet with the person in charge of the program, I found out I didn’t have to do anything and could go get my license. I was hired at Panera Bread in late May shortly after graduating, but couldn’t take myself to work until after I got my license in July. Then in August I was hired at Walmart. For a while I was a bit lacking in direction. I knew I wanted to be a writer, but I was not taking active steps toward it for the most part. At some point in the fall my friend Justine reached out to me about writing for a blog she wanted to start. Initially we had four people, two of them unfortunately had to leave the project for the time being. Justine and I were still committed to starting the blog, and we launched in February. That gave me some focus and it felt like I was taking real steps toward my goal of someday making money writing. Additionally, I applied to Praxis in October for the second time and was accepted. Between Over the Invisible Wall and my acceptance into Praxis, I felt like I had a clearer picture of the near future and that I was taking real steps toward my goals. Less than a month ago I decided to commit to my decision to start a personal blog and launch in July. I knew that if I waited til I felt fully prepared I would never start, so I needed to jump in as soon as possible. At first I was only going to post at least once a week, probably twice, in order to have more time and be “comfortable.” I quickly changed my mind and have been posting every day instead. So that’s about what my past year has looked like. I’ve taken some big steps forward from unfocused general goals of making money writing to actually working towards that. I can’t wait to see what the next year holds and how much things change between now and then. To everyone who is part of my journey now and to those who will join me in the coming year: Thank you. It’s been a wild ride and I’m sure it will continue to be. All the poems I have here were written in July in previous years. Each is the first poem I wrote that July. I had wanted to share poems written on July 3 specifically but there were none. is reeling and pealing away my skin. And yet too short for it to have been another year. in a jumbled, hectic mess. I’m still writing, still plotting, still mentally involved. But who I make myself to be. ‘Cept I lived among the sea. My form shifts, and that is how they greet me. They do not realize ,and that will be their fall. as my life was on display. so I joined her on that side. WIll my time, she bide? as the mem’ries around us flow?